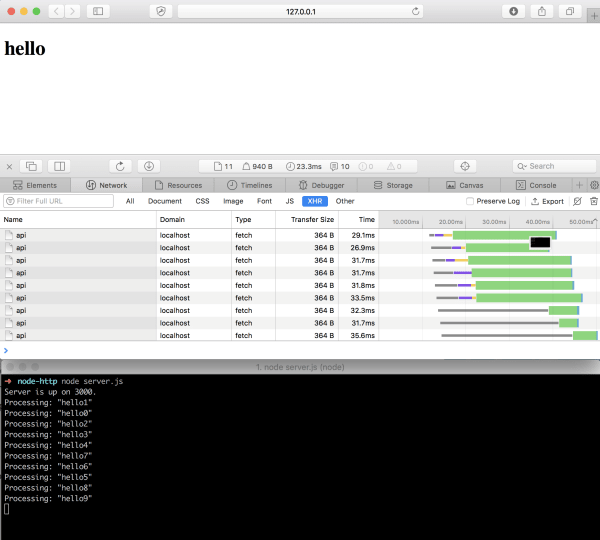 Browsers, as well as Node.js, have limitations on concurrent HTTP connections. It is essential to understand these limitations because we can run into undesired situations whereby an application would function incorrectly. In this article, we will review everything that you, as a developer, need to be familiar with regarding concurrent HTTP connections. For the rest of this article remember the number 6 - this will play a crucial part when we go through our example. 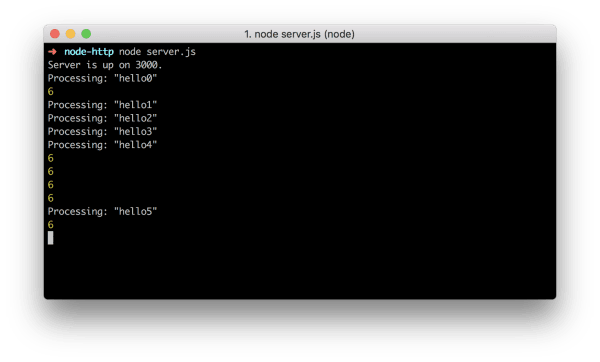 The actual limit of connections in Node.js is determined by the available resources on the machine running the code and by the operating system settings as well. In version higher than 0.10 the maxSockets value has been changed to Infinity. Let's take a look at a very straightforward example. Let's assume that we have some sort of a frontend where we are sending data to a backend (this is usually how modern applications work, a frontend framework making requests to a Backend API). For the our example, the data that we are sending is less important - it's equally applicable to a bulk file upload or anything else. Trivia: I have in fact came across this issue while working on an application that did a bulk upload of images and sent it to a backend API for further processing. Here, the Fetch API is used to iterate through 9 items (mimicking an upload of 9 files for example) and sending 9 HTTP POST requests to the Restify API discussed earlier. Start up the API, also load the index.html via an HTTP server and let's see the results. Here are two easy ways of firing up an HTTP server in an easy way: either use python -m SimpleHTTPServer 8000 (v2) or python -m http.server 8080 (v3). Or do a global npm install of http-server and then just do http-server from the folder where you have the index.html file. It's fascinating what we see. Even though we have made 9 HTTP POST requests only six have arrived to the Restify API since we see 6 log statements. However, if you wait about 2 minutes, additional log statements will appear. 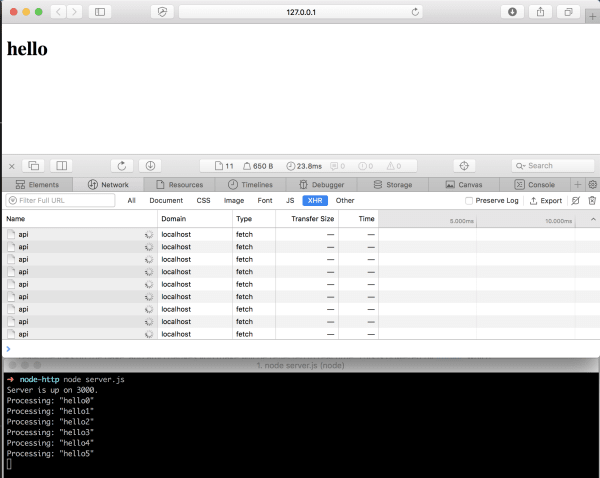 Remember what we said before - the browser (in this case Safari) is capable of making six requests to the same host (in this case the connection is between our browser and the API running on port 3000 on localhost). The connection is kept alive because we are not returning anything from the Node.js API. This was the mistake that I have deliberately made to make a point. So the browser sends six requests, and Node.js receives these but it never sends any information back rendering the remaining requests to be blocked. So why are the other log statements visible later? The answer is simple: there's also a timeout, which is by default 2 minutes. After 2 minutes the request is cleared, so new requests are processed. The result is going to be a lot different. Since we are overwriting the timeout of the server, we only wait 500 ms and get rid of a pending request, allowing new requests to come in. Please note that this is not a real solution to this problem, it is just for demonstration purposes. All uploads are now processed just fine. Remember, res.json() under the hood uses res.send() which in turn also uses res.end() to send a response and to end it. This is true for both Restify and Express.js as well. What is the moral of the story? Always close HTTP connections - no matter how, but close them - if you're making API calls consult the API documentation as well to close any active HTTP connection.